Say "Thanks" to a Sports Official today! Photos from the event have been posted to our Facebook page - here. See the results of the BC Provincial Championship Bobsleigh and Skeleton Races held on the weekend of March 15/16. WHISTLER, B.C. - In nine days Canadians will be cheering on its elite winter athletes during the Opening Ceremony of the Sochi 2014 Olympic Winter Games. Congratulations to Nick Voss - FIBT Jury Exam! Congratulations to Nick Voss who passed his FIBT Jury Exam! This means that just shy of four years since our home Olympic Games, where bobsleigh and skeleton were brand new to all of us, we have continued our strong legacy of officiating with three “in house” Jury members able to tackle Race Director and Jury duties on our venue. 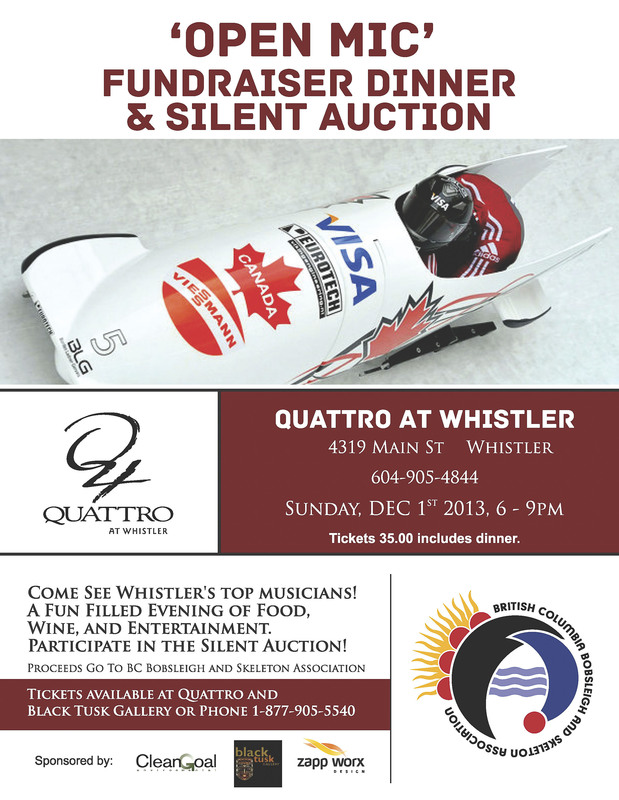 This Sunday, December 1st, 2013 from 6pm to 9pm at Quattro at Whistler - Bring your appetites and best friends to an evening of entertainment and fine dining. 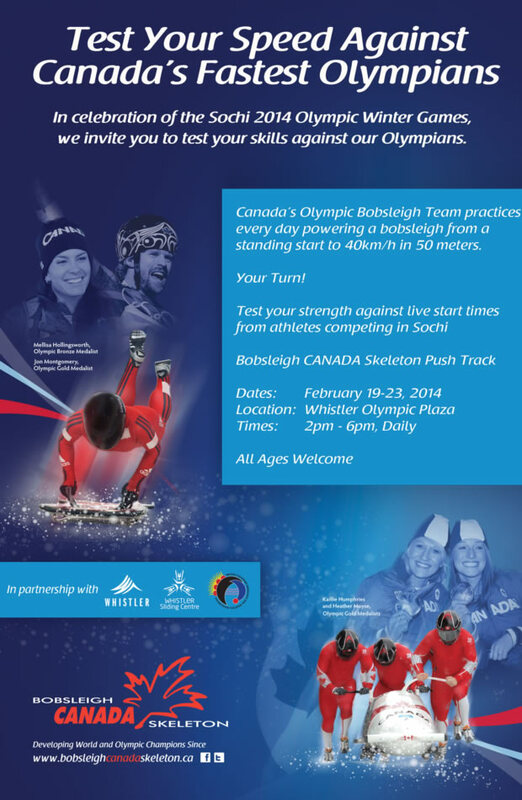 Tickets are $35 per person with all proceeds going to the BC Bobsleigh and Skeleton Association. There will also be a silent auction table - an opportunity to maybe pick up a few Christmas gifts or perhaps something for yourself! On November 30, British Columbians will join citizens across the country to celebrate RBC Sports Day in Canada. As part of this annual celebration of sport, we are joining ViaSport and the BC sport sector in the launch of a Play ViaSport campaign which works to educate citizens on how easy it is to try not only Bobsleigh or Skeleton, but the numerous other opportunities offered throughout the year via sport organizations and clubs located in communities across our beautiful province. Ice Making Volunteers Wanted! Winter Operations are about to Begin! They're turning on the ice plant at the Whistler Sliding Centre this week and are looking for volunteers to give them a hand with it. If you've ever want to get up close to the track and see if there's anything in the associated sports for you - now is the time to get out and into the track for real. We would love to have volunteers for minimum of 3 hour shifts starting @ 1330 and 1600 each day from October 1st through October 7th. We are looking for 2 to 4 people for each shift. Bobsleigh CANADA Skeleton, through President Reid Morrison, is pleased to announce that Diana Rochon (BCBSA) (Skeleton) and Wayne Page (Bobsleigh) were recognized for their contribution to our sports by receiving the 2013 President's Award at July 16th Annual General Meeting. I want to thank Diana and Wayne for all that they give to our sport and congratulate them on this recognition for their efforts.